Many folk will be going to Christmas lunches and parties this week – including New College Library staff. Outside our office window the Edinburgh Christmas fair is in full (and noisy) swing, celebrating the season. This eighteenth century pamphlet, A discourse concerning the lawfulness and right manner of keeping Christmas, gives an eighteenth century view on seasonal celebrations. It takes the form of a dialogue between a master and scholar, prefacing the discussion with the quotation of Bible texts that urge sincere and temperate behaviour. It unpicks the theology of Christmas from an early eighteenth century Anglican point of view, negotiating the scriptural and historical justifications of the observance of Christmas as a holy day and the contemporary differences in practice with other Protestant Churches. The author looks back on the abolishment of Christmas celebrations (including plum pudding) under Oliver Cromwell’s Puritan regime after the English Civil War. It is possible both this period and the Restoration of 1660 may have been within the author’s living memory. 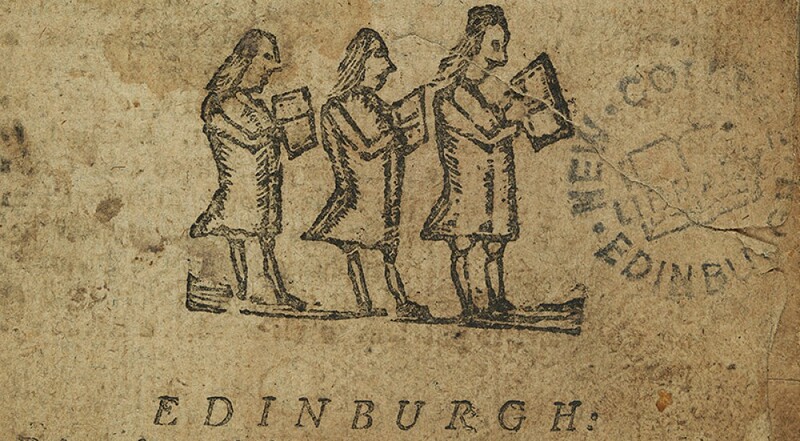 This book is also available online to University of Edinburgh users via Eighteenth Century Collections Online, where it can be read online in full. This item is from New College Library’s Z Collection, currently being catalogued as part of the Funk Cataloguing Projects at New College Library. This entry was posted in Rare Books at New College Library and tagged Christianity, Christmas, church history, Church of England, Edinburgh, eighteenth-century, Funk, new college library, rare books, Theology & Ethics, theology in history, Z Collection by cloverodgers. Bookmark the permalink.